Hamilton’s Hall in Georgetown once featured a space on the second floor that hosted campaign rallies, dances, secret-society meetings and more. THIS WEEK, Pacific NW magazine readers are asked to figure on their own the date of this Georgetown street scene, perhaps from the motorcars that are parked on it. 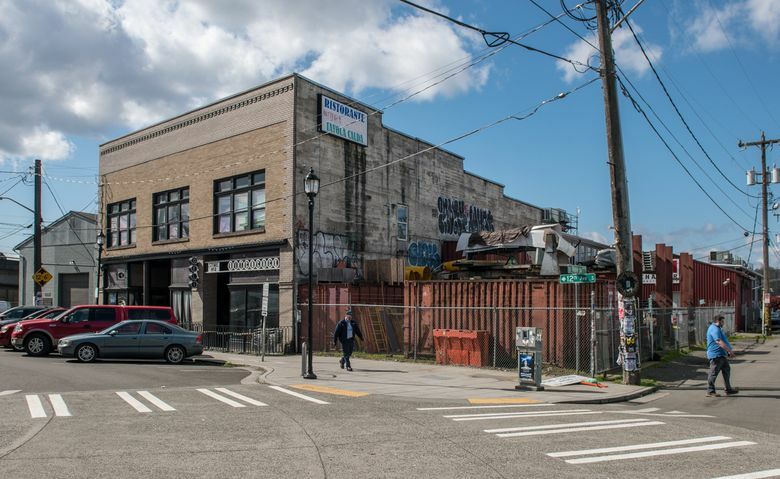 Whatever the year, and I’m speculating circa 1920, the spread of businesses in the three contiguous business blocks snugly grouped here on the west side of 12th Avenue South, south of Vale Street (on the far right), is downright inviting. Starting at the sidewalk on the left, at the corner with South Harney Street, are “Roma Imported,” mostly hiding behind the open delivery van, and a market of fresh produce sharing the first floor of the smallest of the three two-story buildings. One can imagine vegetables in the boxes shining through the plate-glass window. Most likely, there are a few rented apartments upstairs. The bigger building at the center is The Hamilton. It prominently features an all-brick facade. We have learned from John Bennett, one of Georgetown’s contemporary freeholders, that it is actually a concrete box covered on the street side with a layer of decorative brick. More than a century of rain has seeped between the box and its covering, staining some of the latter. The construction date, 1907, has been artfully split to either side of the hotel’s name. From the left, the first of the three sidewalk shops is a shoe-repair business. In the middle is the Working Man’s Store, which features clothes and shoes. (Perhaps one could purchase new and used shoes here, although we will note that this glass negative was recorded by the Webster and Stevens Photography Studio years before the Great Depression, when used shoes were in greater demand.) The third of the merchants busy at the sidewalk is the White Front Restaurant. It is neatly signed on the window. Marcus and Martha Hamilton and their family lived behind their namesake hotel and hall. They owned the block. Marcus served many mostly uncontroversial years as a King County Commissioner. When the first five floors of the City-County Building at Fourth and Jefferson were dedicated on May 4, 1916, Marcus was the keynote speaker, along with Hi Gill, Seattle’s exceedingly controversial mayor. With its big room and high ceiling on the second floor, Hamilton’s Hall served a wealth of patrons for campaign rallies, dances, secret-society meetings and such. Its rooftop sign radiated like the sunrises it faced over Beacon Hill between 1903, the year of its construction, and 1972, the year of its teardown. Check out Paul Dorpat and Jean Sherrard’s blog at pauldorpat.com. 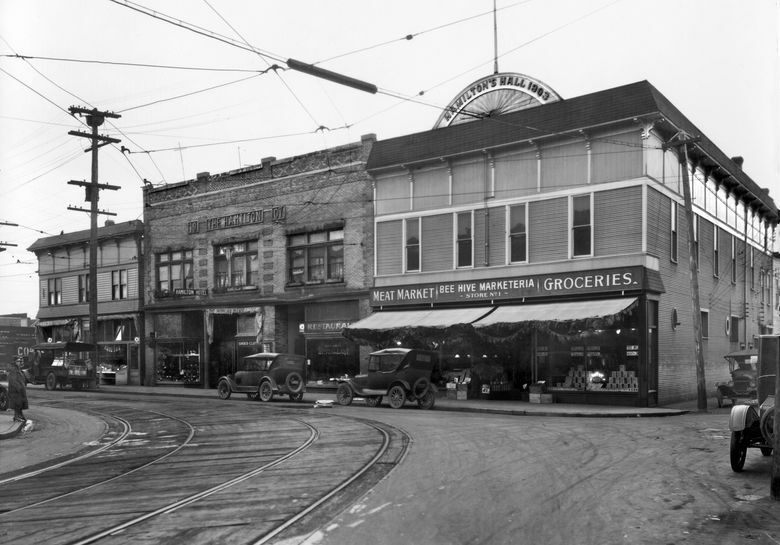 You’re invited to “An Evening with Paul Dorpat on Wallingford History,” Friday, May 18, at Seattle First Church of the Nazarene, 44th Street N.E. and Second Avenue N.E.